No doubt, there are numerous Etsy jewelry shops but, there is no reason you cannot be successful selling on Etsy...wildly successful! First let us start by analyzing Etsy. One of the most remarkable things about this site is that there are no secrets. Etsy is an open book for you to read and study and I will show you how to do so with this mock shop diagram that I have made below. This is a purely fabricated shop with sales figures and dates that I pulled out of a hat and they are simply for the purpose of study. First start by choosing any Etsy jewelry shop that has made it to the front page of Etsy ...or any Etsy sellers that you like. The first section to look at (#1) is the date that the shop joined. By this date you can calculate how many months the shop has been open. Then, you can look at the number of sales that have been made since the start date (#2). Lastly, by looking over the items for sale (#3) you will be able to get an idea what the average price for an item is. In order to have a more in depth idea of the sales for a single shop click on the sales and have a good look at "what" is selling. To be even more thorough, check the shop sales history and find out how many sales per day, week or month they are getting. You will be able to get a general idea of what a shop is bringing in by multiplying the monthly sales by the average sale figure. Of course it will not be exact but, you will have a general idea. 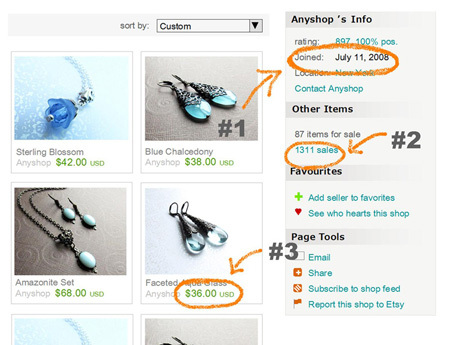 You can also look at the very first sale date to find out how long any given Etsy jewelry shop has actually been posting items and how their sales have evolved over time. For example, some shop owners are simply members, perhaps only purchasing on Etsy, long before they feel they are ready to post items for sale. By analyzing an Etsy jewelry shop you will get an idea of how their sales growth has progressed, what sorts of products they seem to be selling more of and how they may have specifically geared their product to fit with sales trends. 1) Has this shop experienced growth spurts? 2) Where there any changes in product, photography, descriptions during periods of increased sales? 3) Does the shop have a blog or any social networking strategies such as Face book or Twitter? 4) What do I like most about this Etsy jewelry shop? 5) What is the photographic style that is used? 6) How do I like the product descriptions? 7) How are the prices? 8) Does the shop feel friendly and inviting? 9) What are the shop policies? 10) Do I feel connected to the designer or shop owner? 11) What kind of feedback are the buyers leaving for this shop? These are all important questions to ask in order to contemplate how to build a shop that is comprehensive and answers all the needs of a buyer. The purpose of this exercise is not to copy any given Etsy jewelry shop but, rather to arrive at a style that fits you and to leave no stone unturned when you put forth your best work for sale. If you would like to research the top Etsy sellers here is a site that will let you search Etsy shops by category. You can have a look at the top Etsy jewelry shops. I compared two Etsy jewelry shops that joined around the same time. Both shops have been selling for two years and have price points at the opposite end of the scale. The lower priced shop which I will call shop "A" has sold twenty times the items that shop "B" has sold and yet shop "B" has earned about twice as much. When planning a shop product consider what the quality of experience may be. Do you want to make one-hundred bitty things a day like a factory? After years of producing jewelry in volume I would opt for the quality items in lesser volume but, don't let me make that right or wrong. Perhaps you are energetic and will decide on a trend setting design that will sell in volume. Perhaps you will consider hiring someone to help you. I am simply posing a question about what you want...what best suits you. The stage that I am in at this time in my life is different from where you or anyone else may be. I should also mention that shop "A" had their peak selling period quite some time ago and now their sales are slowing down while shop "B" seems to still maintain. My estimation is that shop "A" has been copied and re copied by multiple shops and it's exclusivity is diluted. I also suspect that the trend is on the slowdown as well. This is typical of the fashion industry and that pertains to jewelry as well. It is referred to as the trickle down effect. In high fashion new trends would be desired and exclusive....those designs would be knocked off by other companies until eventually you would see the bottom of the barrel at bargain basement shops... and by then the trend would be on its way out. There is nothing wrong with cashing in or creating a trend. Just bear in mind that while the trend is at its hottest you might consider where you will go next and start creating the next trend. Don't blow all your money on hats thinking that the cycle will stay the same. Stay on top, invest your money and move on to the next idea. That's what what I say...make it work for you! After following all the advise out there about selling on Etsy if you still find that you are not getting the sales then, it is time to re-evaluate. Start by re-evaluating your product, your prices, your photography and your marketing methods. If you cannot see it objectively ask other to give you feedback. You can even go on a forum and ask for feedback. It is a competitive world and it takes time to build a business. Over the years I have seen designers much younger than me come on the market and build fabulous success much quicker but, we all have our own process in pursuing our dreams. What may come easily to some takes much concentrated effort by others. Everyone comes from diffrent backgrounds, life experiences, financial situations, self confidence etc. All that really matters is you and what you want. Many Etsy sellers struggle with how to make sales and that is no different from any other business. The biggest accomplishment is to not give up. Perserverance on your Etsy jewelry shop will get you where you want to go. Stay focused and make it happen!